This is just a quick bugfix for those of you with square screens. Ed Thompson found the bug where square screens were not displaying correctly. I had set anchors when I shouldn’t have, and it should now be fixed. In doing this, I also fixed the landscape(rotation) bug. You will need to have followed the upgrade instructions for .26 already to make the DB change. As always, .Net 3.5 and SQLCE are required. I wanted to release something more “done” as an RC, but this will work too. I needed to fix a bug in the maintenance table but you guys also have a treat…….a new tapping method to enter the ODO reading. YOU MUST HAVE .26B BEFORE UPGRADING TO THIS VERSION. Basically, you need to have done the database change instructions from before. Doing them again here will also work. The G and M in front tell the program that it is a gas or maint row. The last two values in the gas table are NOT necessary in that the program calculates them when it runs, so if you are importing from other data you do not need to worry about them. 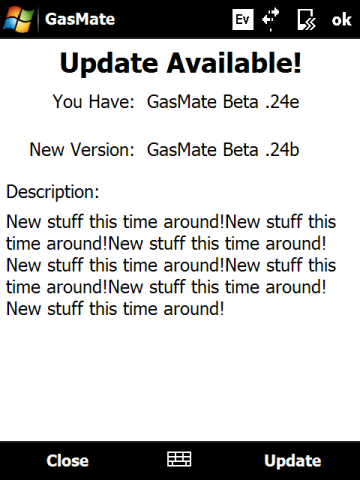 Those of you with .24a or b will be able to update right from GasMate. There is only one major change that I have done in this version…..
You can check the box to have it check for updates on every start or you can click the button to manually update. OH HAI. Welcome to LulzSoft!